Shree Veershaiv Co-op Bank Kolhapur (Shree Veershaiv Co-op Bank Ltd), Kolhapur published a new job notification for Civil Engineer, Clerk & Peon Posts. The willing candidates are informed to see the latest notification April 2019. Qualification required Diploma/Degree in Civil Engineering, Knowledge in Computer, 12th Pass and More. Last Date of offline application is 15-04-2019. 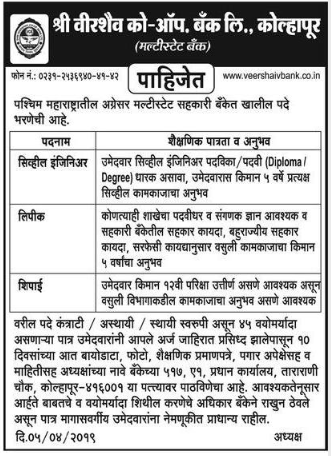 For More details of Shree Veershaiv Co-op Bank Kolhapur Recruitment 2019 Read Below. Education Qualification: Diploma/Degree in Civil Engineering, Knowledge in Computer, 12th Pass and More. For Post wise Education Details follow the detailed advertisement. Interested & Eligible candidates can send their application along with all the necessary documents and testimonials to Shree Veershaiv Co-op Bank Ltd, 517,A/1,E Ward, Tararani Chowk, Kolhapur. Application starts offline 05-04-2019. Last Date of application is 15-04-2019.